President Trump and I have at least one thing in common: we were both alone in our respective homes on Christmas Eve: family-less, alone - as if a wall was built between us and humanity. And it did not cost USD 5 billion to build. It seems we do have a similar liking for gold. POTUS, of course, likes his splashed all over his house in New York and, reportedly, on the toilet bowl. Mine is parked in the Quantum Gold Savings Fund, in the Quantum Gold ETF, with a little bit in coins and bars. So far, gold has done well this year and behaved like the insurance it needs to be in a portfolio. But there is a certain poignancy of a President of the United States, reportedly the most powerful man on Earth, sitting alone trapped in his own centre of command. His TV screens probably told him that the US stock market was in "bear territory', down 20% from recent highs. His advisors probably told him that firing the head of the US central bank, the Federal Reserve, was not a great idea to toss around. In India throwing out a Governor of the Reserve Bank of India, the Chairman of SEBI, or heads of any institutions is par for the course for any worthy politician of any political party. We even had the instance of the worst prime minister in India's history, Indira Gandhi, throwing out the Constitution and declaring an Emergency - an act for which the Congress and the descendants of the Gandhi family have yet to apologise for. Trump is upset that the Fed raised interest rates for the 4th time in the calendar year 2018 and is not supporting him in his great war for Making America Great Again: "The only problem our economy has is the Fed. They don't have a feel for the Market, they don't understand necessary Trade Wars or Strong Dollars or even Democrat Shutdowns over Borders. The Fed is like a powerful golfer who can't score because he has no touch - he can't putt!'". So sayeth POTUS who comes out swinging with his club at every situation and does not seem to approach any problem with the finesse of the firm, but light, putting club. But while the POTUS is having issues with his version of MAGA, our own leadership is having issues with their version of MAGA that seems to have helped a favoured few at the cost of many. Based on the election results, India does not seem to be shining, though our own MAGA elite may be. The US economy is likely to slow down as interest rates dampen demand. The Brexit gridlock is not helping the case for Europe being any kind of engine of global growth. India is busy creating GDP numbers - but creating real wealth is not easy when onions sell for Rs 1 / kg. Jobs are scarce and there is a limit to how many people can be lynched in the name of gai-mata. Within the BJP, people may be asking the question: How likely are we to form a coalition government? Any thoughts of the BJP winning a thumping majority in the May 2019 election may be as wild as believing in Santa Claus. Nitin Gadkari's reported comment to a security conference was that he was not a security expert so he would not discuss security. Instead, he discussed responsibility. "Leadership should have the 'vrutti' (tendency) to own up the defeat and failures. Loyalty of the leadership towards the organisation will not be proved till the time it owns up responsibility for defeat," he said." (Times of India). We don't know where this is going, but it is possible that Trump and I were not the only ones 'Home Alone' on Christmas Eve. Anyone saw a tweet from the invisible invincible? The great thing for India, though, is that the price of oil continues to decline. Everything else looks uncertain for the near term. 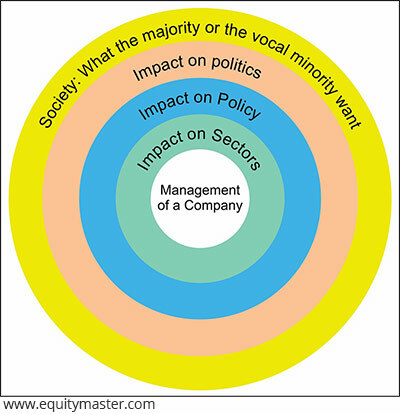 Equitymaster requests your view! Post a comment on "Home Alone". Click here!